Yo, Adrian! It was announced yesterday that the two leads of the new Broadway musical, Rocky, have been cast. 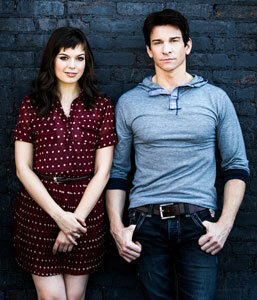 Andy Karl (Drama Desk nominee for The Mystery of Edwin Drood, Jersey Boys) will step into the ring as the man himself, Rocky Balboa and Margo Seibert will make her Broadway debut as Adrian in the new musical. Rocky begins previews February 11th and officially opens on March 13th at Broadway’s historic Winter Garden Theatre (1634 Broadway). Andy Karl can currently be seen in a return performance on Broadway as Tommy DeVito in Jersey Boys, following his critically acclaimed performance as Neville Landless in the Broadway revival of The Mystery of Edwin Drood, for which he was nominated for a 2013 Drama Desk Award for Outstanding Featured Actor in a Musical. A native of Baltimore, Andy’s parents enrolled him in an after school theatre program in high school to “keep him out of trouble” and what started as a way to channel his energy soon became a passion. After moving to New York a few years later, Karl quickly made an impression in the theatre community starring in Romeo and Bernadette, for which he received a Carbonell nomination, the Off Broadway production of Saturday Night working alongside Stephen Sondheim and Kathleen Marshall, and his stand out performance as Luke, the thuggish rapper in the original cast of Alter Boyz. Andy went on to star in numerous Broadway productions including 9 to 5, Legally Blonde (ACCA Award), and On the 20th Century, among many others. His film and TV roles include Joyful Noise; Rob Reiner’s And So It Goes (opposite Michael Douglas and Diane Keaton); Legally Blonde: The Search for Elle Woods; On the One; and New York, I Love You. The musical brings to life the iconic and inspiring story of struggling small time Philly boxer, Rocky Balboa, who gets a once-in-a-lifetime shot to go the distance against heavyweight champ Apollo Creed. ROCKY received its world premiere in fall 2012 in Hamburg, Germany, where it earned critical raves and where it continues to play to packed houses at the Operettenhaus Theatre. Tickets are now on sale at Telecharge.com or by calling 212-239-6200. Please visit ROCKYBROADWAY.com for more information.